his instrument features metal frets instead of the traditional knotted-gut frets of the Renaissance era. 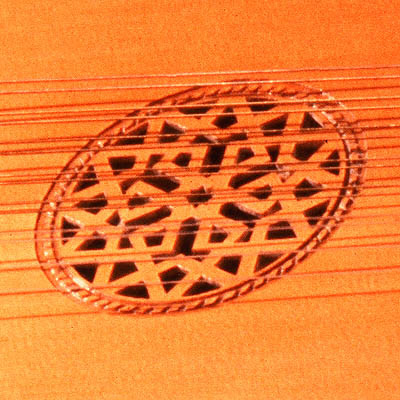 When luthiers began to make lutes in the twentieth century, they used metal frets like those on the modern guitar. 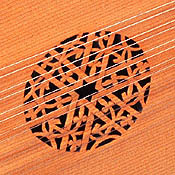 Moreover, lutenists during the revival of early music were often guitarists, whose playing technique was not geared to the lute. 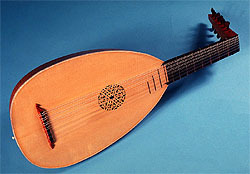 This lute is typical of instruments built in the early 1970s, when there was a burgeoning interest in early music and instrument making in Canada. Some twenty years later, the same luthier built the instrument labelled Opus 53. 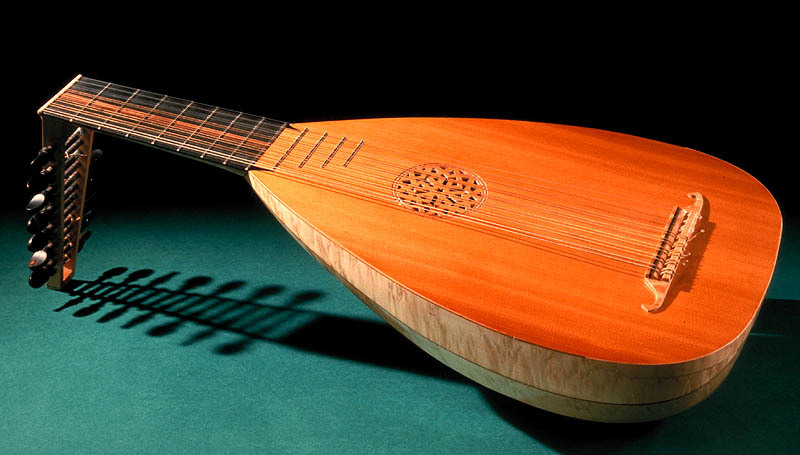 Based on an instrument by Giovanni Hieber, a German luthier who settled in Venice in the second half of the sixteenth century, this lute has seven courses, or pairs of strings. 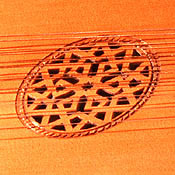 The body is made of strips of maple, and the soundboard of spruce, embellished by an Arab-style rose carved in the wood. The instrument is sparingly ornamented as the luthier preferred a simple style, more in keeping with the instrument commonly used during the Renaissance. Highly decorated lutes, and those made with rare materials such as ivory, were reserved for the nobility and upper middle classes. A native of England, Colin Everett settled in Ottawa when he immigrated to Canada in 1966. He studied guitar at that time, but gradually became interested in the lute. As lutes were difficult to obtain back then, he decided to build one. While Everett now specializes in lute making, his fascination with Renaissance music has also led him to make other instruments of that period, such as the viola da gamba, harpsichord, crumhorn and rackett. He has belonged to several early-music ensembles and performed at numerous concerts and festivals. His instruments, which include over seventy lutes to date, are played in Canada, especially in Quebec. In addition to pursuing his musical activities, Colin Everett currently teaches chemistry at Algonquin College.